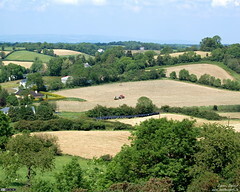 A typical shot of Cavan (Ireland) in summer. The rolling hills, called drumlins, are very common all over Cavan, and the patchwork effect when some fields have recently been harvested while others haven't livens up the landscape in the summer months. This shot is formatted for use as a desktop wallpaper on standard (4:3) displays.